Only 34% of Americans age 55+ do NOT have a will. Do you? If you died today, will your wealth follow your wishes? Have you ever thought about the type of legacy you’d like to leave? To whom you’d like to leave it? And how you’d like to leave it when you die? Unless you know you will exhaust a lifetime of accumulated wealth the day you die (or your surviving spouse dies), you may want to consider how that wealth will be treated. Money needs instructions to know where to go when you die. Are there updated instructions to help direct your wealth? Three common tools to transfer wealth to others are; by contract, by will, and by trust. Business agreements, real estate contracts, life insurance policies, and brokerage accounts are generally governed by contracts, which may take precedence over the wishes written into a will. How much of your wealth is to be transferred based on these contracts? It may be substantial. The simple act of ensuring the beneficiary of a life insurance policy or investment account is updated may help ensure that potentially large sums of money are transferred to the proper individuals. Many people buy a life insurance policy, for example, and do not review the beneficiaries of that policy for decades. How many marriages, divorces, births, deaths, and changed interests have occurred over that time? 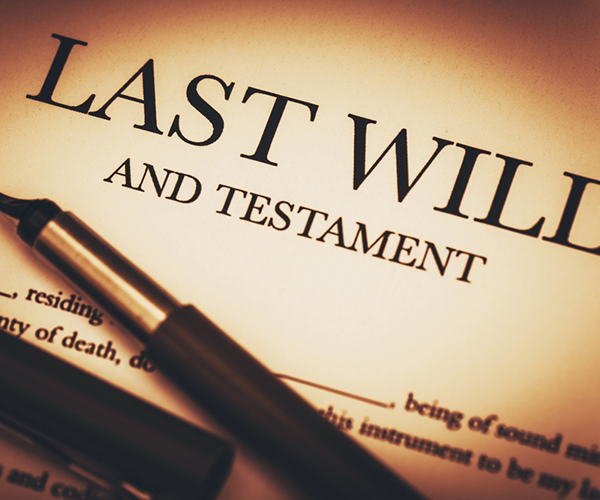 A will is a legal document that specifies how an individual’s wealth is to be distributed when that individual dies. Probate courts examine the will, determine if it is valid, and grant powers to an executor to take responsibility for distributing the property of the deceased, according to the terms of the will. Information that is handled by a public court, such as a probate court, is public information. Unless you want to risk advertising your wealth affairs to others, another means of transferring wealth may be preferred. A trusts is a legal entity which is designed to hold wealth for the benefit of others. Trusts may provide protection from creditors and predators and avoid unnecessary tax burdens. It may also be a way for individuals to control assets “from the grave” (because the terms of the trust they created may survive them). Control of a trust resides with a trustee, the individual who has accepted responsibility for managing the trust. In the efficient transfer of wealth to “others”, “others” may be a charity, a family member, a spouse, or a business partner. Because of the legal and tax ramifications of the various methods of wealth transfer, you should seek legal and tax counsel to help ensure the unique needs of each individual are met. Will your wealth follow your wishes? When was the last time you updated those documents? Are your insurance and investment accounts titled to your wishes? Click here to review them. Representatives of Signator Investors, Inc. do not provide tax and legal advice. Please consult your tax advisor or attorney for such guidance.